Sioux Falls and Rapid City both generally outperformed surrounding areas in the Northern Great Plains. Economic growth in South Dakota’s two major metropolitan areas in 2015 paints a tale of two cities, according to figures released today by the U.S. Bureau of Economic Analysis. While growth slowed to 1.0 percent in the Rapid City metropolitan area, Sioux Falls enjoyed a modest 2.2 percent expansion. Even the stronger economy in Sioux Falls, however, finished below the national average. Real gross domestic product (GDP) in the nation's 381 metropolitan areas increased by an average of 2.5 percent in 2015. In the Rapid City metropolitan area, GDP grew from $6.23 billion to $6.41 billion in current dollars., while in Sioux Falls total GDP increased from $17.92 billion in 2014 to $18.73 billion. 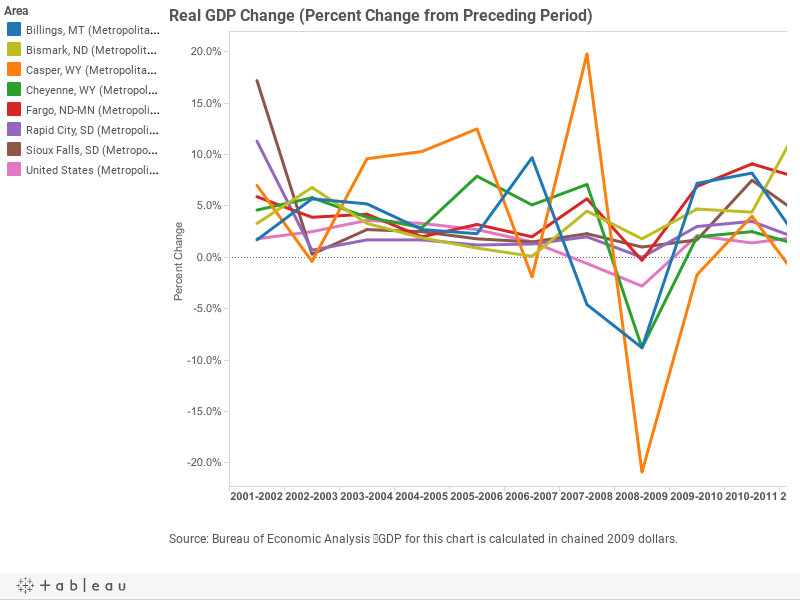 In Rapid City, economic growth was driven primarily by activity in Trade, Education/Health Care/Social Services, Construction and Natural Resources/Mining, while Services suffered a decline. Meanwhile in Sioux Falls, Finance/Insurance/Real Estate was the leading growth sector with Professional Business Services and Education/Health Care/Social Services also making substantial contributions to make up for declines in manufacturing. Sioux Falls and Rapid City both generally outperformed surrounding areas in the Northern Great Plains. Casper, WY experienced 0.4 percent growth while Cheyenne, WY saw only a 0.3 percent increase. Fargo, ND experienced a significant decline from its 3.1 percent growth rate in 2014 to only 1.3 percent growth in 2015. Sioux City, IA and Bismarck, ND both saw significant growth at 2.8 and 5.7 percent respectively. With its release of 2015 data, the BEA also revised its calculation of economic growth in prior years based on new information. For Rapid City, the revised numbers indicate that the post-Great Recession recovery slowed in 2012 to 1.5 percent. In 2013, the economy contracted and GDP was negative 1.4 percent, rather than the previously reported 0.9 percent decrease. And when the economy recovered in 2014, the recovery was stronger, with economic growth at 3.5 percent, compared to the 1.3 percent previously reported. For Sioux Falls, the new numbers indicate that the metro area’s economy was much weaker than previously estimated. Growth slowed considerably in 2013 and 2014 to 0.2 and 0.5 percent respectively, compared to 1.5 percent and 1.7 percent reported earlier by the BEA. Like Sioux Falls, Cheyenne, WY showed less recovery in 2014 than previously recorded. Estimates for 2013-2014 showed a 2.2 percent increase which was revised to 0.4 percent increase this year. Additionally, estimates in Casper were revised to show a two-year economic slump from 2011 to 2013. Previously a decline was only shown from 2011 to 2012. Estimates in Billings, MT and Fargo, ND remained similar to 2014 figures. This post has been revised. The original version incorrectly stated that the Rapid City Metropolitan Area’s GDP in 2012 was 3.5 percent; it was actually 1.5 percent.